Researchers from the University of California San Diego discovered that maintaining high levels of the protein vinculin—which sticks heart muscle cells to one another—confers health benefits to fruit flies. 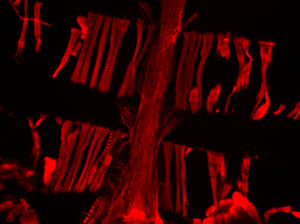 Their work, published July 17 in APL Bioengineering, shows that fruit flies bred to produce 50 percent more vinculin enjoyed better cardiovascular health and lived a third of their average life span longer. Paper title: "Preserved cardiac function by vinculin enhances glucose oxidation and extends health- and life-span." Co-authors include Ayla O. Sessions, Peter Min, Thekla Cordes, Barry J. Weickert, Ajit S. Divakaruni, Anne N. Murphy and Christian M. Metallo. This work was supported by the National Institutes of Health (R01AG045428, R01CA188652, R01NS087611, F32HL131137),the American Heart Association (15PRE25090334), the National Science Foundation (1454425), Deutsche Forschungsgesellschaft (German Research Foundation; CO1488/1-1) and California Institute of Regenerative Medicine (RB5-07356).